Having the best distribution system in the world won't matter if your substation isn't operating properly. Recognizing that, MMUA annually presents a Substation School. The 2017 school was held at the Ziegler facility in Shakopee. There was a pre-conference PCB workshop. This school typically offers a wide variety of training with different experts in the field. 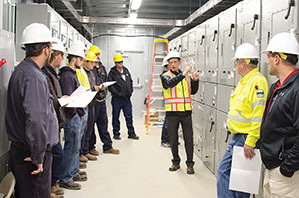 The school is designed to be beneficial to the substation technician as well as the lineworker that is learning more about substations. You can find more information about the 2019 Substation School and register online here. We now have a 4-minute rodeo recap video of the 2016 Public Power Lineworkers Rodeo, live on the MMUA YouTube channel. It features great footage and interviews with a number of key players in the event. The April 2 event was hosted by Shakopee Public Utilities and MMUA, and brought together lineworkers from across the country. Watch this video and enjoy reliving that amazing day. Be sure to bundle up before you click!